MSI releases the new Z270 GAMING M6 AC motherboard thus expanding their Enthusiast GAMING motherboard lineup under the Intel 200 series. The motherboard features all the cool design and high-end gaming features from the M6 with added features such as Audio Boost 4 with Nahimic 2, VR Boost, Twin Turbo M.2 with M.2 Shield and Killer LAN & Intel WIFI AC. The motherboard is also MSI Mystic Light Sync ready for RBG lighting customization with other Mystic Light Sync compatible hardware. 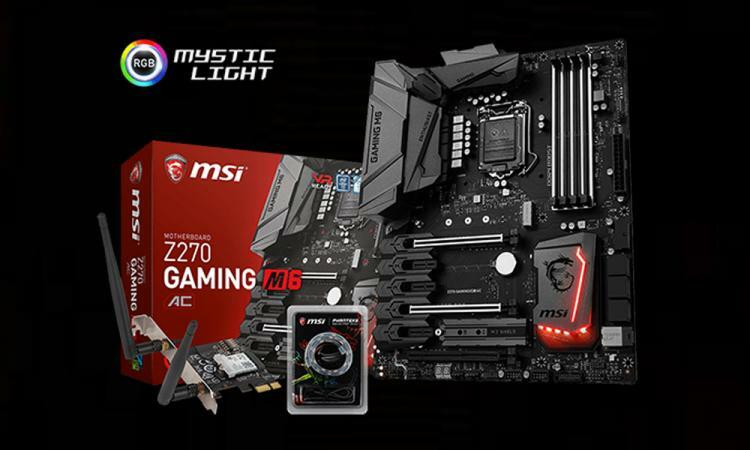 The MSI Z270 GAMING M6 AC aims to be one of the most desirable high-end Z270 motherboards builders and gamers would consider for their next-generation gaming PC. DDR4 Boost guarantees maximum stability and performance on your DDR4 memory by fully isolating the memory circuit design. The improvement will enhance gaming performance as well as in other workloads. Enable Intel Extreme Memory Profile through the BIOS with ease. The Twin Turbo M.2 delivers PCIe Gen3 x4 performance with data transfer speeds of up to 64GB/s and it supports the new Intel Optane technology. The M.2 shield is a thermal solution for M.2 or Optane drives to keep it cool at high loads to prevent thermal and performance throttling. The motherboard also offers support for the latest storage interface U.2. VR Boost is a smart chip that optimizes the gaming PC for VR with just one click. The One-Click to VR function will calibrate and set all hardware for optimal VR performance. Audio Boost 4 powered by Nahimic offers the best sound quality by isolating the audio PCB for minimal interference to deliver the purest sound quality for best gaming audio. The MSI Z270 GAMING M6 AC packs a next-generation Intel Wi-Fi / Bluetooth solution uses smart MU-MIMO technology, delivering AC speeds up to 867Mbps. Perfect for streaming and gaming at the same time. Comes with a Phanteks RBG LED strip that is MSI Mystic Light Sync compatible. Simply connect the plug-and-play strip and customize your RGB lighting via Mystic Light Sync! Visit the MSI website for more information on the Z270 GAMING M6 AC motherboard.